Suddenly, the weather has taken a turn. Its become really hot. The sea breeze too, is hot and we really don’t need to switch the water geyser on as the water in the taps is warm.Coming to today’s recipe, its a vegetable or sabji. I found this recipe in an old Femina magazine that I was reading while at the hairdresser. I have reduced the amount of red chilli as my family does not eat really chilli food. I have made this sabji several times and its a winner with my husband. Its a change from the normal cauliflower potato sabji that my mum and mother in law use to make. Keeping the florets a bit big means the sabji does not have overcooked mushy cauliflower. I hate mushy cauliflower. We are lucky that curry leaves or sweet limdi grows in abundance in Mombasa. Whenever I use it for cooking the aroma is heavenly. I love curry leaves. Adding curry leaves and urad dal makes this vegetable smell like sambhar. 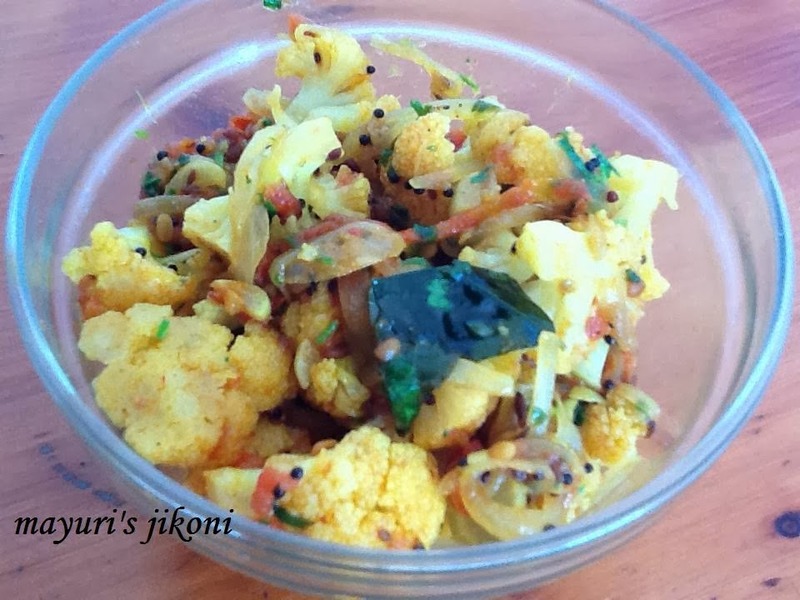 I am sure kids will also love this vegetable or sabji so go on try it out. Trim the leaves off the cauliflower. Cut it into medium size florets. Heat water in a pan. When it is boiling, add the florets to it. Cook till the water begins to boil. Drain out the florets into a colander. Save the water to use as a stock for soup or for dals. Cut the tomatoes into half. Slice the halves lengthwise. Add mustard seeds and as soon as they begin to splutter add urad dal and the curry leaves. Add hing and onion slices. Stir fry the onion till it becomes slightly soft. Add garlic, chopped red chilli and ginger and stir fry for a few seconds. Add red chilli powder, turmeric powder and the tomato slices. Mix well add water and cover the pan. Cook the tomatoes for 2-3 minutes. Add the garam masala, salt, sugar and the cauliflower florets. Add coriander or fenugreek and mix well. Can steam the cauliflower florets instead of blanching it. Use a dry red chilli instead of a fresh one if you like. Looks good! You have a lovely blog. Happy to follow you. DO visit my space sometime too.